Try it once and you certainly feel the difference! High Impact Absorption and Super Comfort! 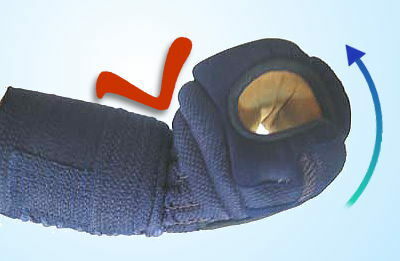 Kote buton (inner pad) won’t bother the movement of your wrist at all. Bend your wrist backwards like the photo below, it won’t touch kote buton. It is nothing like the ordinary kote.Once you wear Kasumi Ryu Kunoji Kote you will be impressed by the flexibility and the comfort you never experienced! Giving great freedom of wide movements! 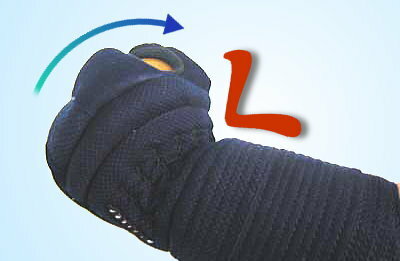 Kasumi Ryu Kunoji Kote has extra protection yet ultimate flexibility that you can bend your wrist to an almost 90 degree angle to shape a "Kunoji", Japanease hiragana ku =　く. 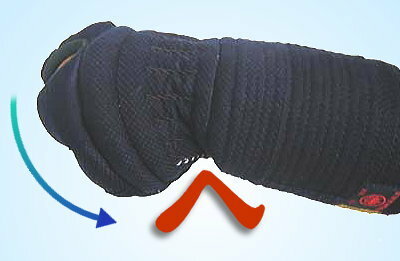 You could bend your wrist backwards to an almost 90 degree angle in our existing Kunoji Kote.We have finally created the best improved Kote ever after extensive research and trials.This Kunoji Kote is the ideal Kote,making it possible to have natural movement of the wrist.That's 360 degrees smooth movements! Kunoji Kote is registered trade name of Fukuda Budogu and it's patent is granted. * FULL CUSTOM-MADE with Hand-stitched. * It is all genuine leather. * TENOUCHI (palm) use the deerskin. You can choose the color of INDEN. *There is a shortage of navy color. Put one hand on paper then trace around your hand with a pen. Make sure that a pen is placed vertically along with your hand. We would like to share some of our customers’ voice we have received to our Japanese online store. 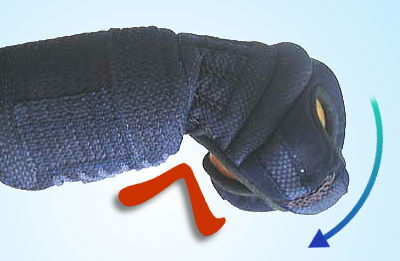 With 100% confident, we strongly recommend Kunoji-Kote to not only Kendo-ka in Japan also all Kenshi outside of Japan. *Excellent quality! there is NO way any other Kote can compare. The best pair I ever had!! *After using Kote purchased from the other shop for years, this is an incredible upgrade! No more painful bruised forearms. A little stiff initially but quickly broken in such a short time. Wrist movement is extremely good and so comfortable. *Your service is always top notch and thanks for helping me with the size. Kote are perfectly fit well. I’m impressed by their comfort and performance. *I can’t use any other Kote anymore! There’s No word to explain the good result of these Kote!! You’ve got to try them! *I’ve heard from my Kendo friends how Kunoji is flexible. Yes they truly are flexible! Kote futon didn’t bother your movement at all. Amazingly flexible and comfortable!!! *I alternated between Kunoji and my standard ones during Keiko.First thing I noticed when I used Kunoji was that I can do Kaeshi quite easily because futon didn't touch my wrists when doing Kaeshi. It was such a small difference i didn't even realize that how uncomfortably bothering you when rotating your wrists with standard Kote. But once you know that how flexible you can go with Kunoji,the difference was huge. I used to do Kaeshi-Do with one hand then now I can do it without letting my left hand go as it is so easy to rotate wrists with Kunoji. It seems like I'm wearing just the gloves not the Kote. These are of exceptional Kote!